Netflix certainly has very high expectations of itself. Having already launched in more than 190 countries, the platform thought it was time to make its move up north—specifically, outer space. As a Hack Day experiment, Netflix’s engineers Tony Edwards and Micah Ransdell sent an iPhone with downloaded content up, up, and away. The footage was recorded with a GoPro camera, which also took in sweeping views of planet Earth. “As a nod to a well-known spacefaring industrialist, we thought it’d be fun to see if we could watch Netflix in space,” the two wrote. The iPhone was streaming Star Trek: The Discovery, which might be a strange choice because the program isn’t currently available on Netflix. A more suitable show would be Black Mirror’s ‘U.S.S. Callister’ that pays obvious homage to Star Trek. 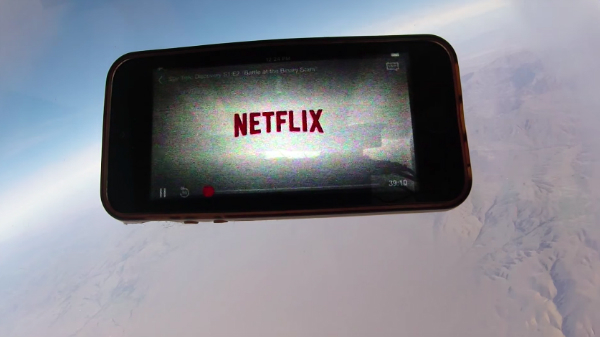 If you’ve ever wondered what it’s like to Netflix and chill 150,000 feet off the ground, this experiment might give you an idea.